Do not entrust the revenue of your company with anyone less qualified than professional salespeople. Start by searching for people who have the talents and passion to sell. 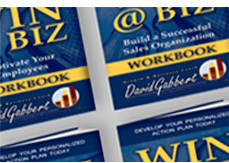 Develop sales tools to outperform the competition. Even the best salespeople need superior tools to do their jobs well. Keep salespeople abreast of current product information. Develop role-playing training programs to improve situational sales skills. Build an accurate list of customer needs, product benefits, customer desires, and objections. Build this list from your customers’ and salespeople’s feedback. From your list, develop role-playing scripts that close sales. Develop a prospect follow-up program requiring accountability for results. Develop an incentive compensation program that motivates your salespeople to deliver the desired outcome.